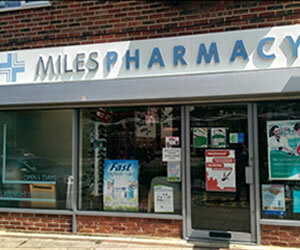 MILES PHARMACY - GOING THE EXTRA MILE! Miles Pharmacy is a family run business and has been providing Pharmacy services to the local community for more than 50 years. Our aim is to provide a service to an exceptional standard to specifically meet the needs of our patients. With new ownership since December 2013, we have a made a number of significant improvements. 96 Chessington Road, West Ewell, Epsom, Surrey, KT19 9UR.